Shortly after the new year, we sent our clients our Quarterly AlphaFlow Investor Letter, sharing our thoughts on our industry and how we view the investment landscape today. You can find that letter below: Please click HERE to download a PDF of this January 2018 Quarterly Investor Letter. There is more noise than ever in the market, but I believe the cycle has a long way to go in a number of cities around the country. Diversification is necessary but not sufficient in this fragmented market filled with bespoke underwriting practices and a lack of standardized metrics. Ultimately, we still see attractive risk-adjusted returns, but they require more work than ever to earn. Thank you for entrusting us with such an important part of your life. Happy New Year! Best regards, Ray Sturm Additional Note: I’ve heard from a number of you that you’d like us to write about the market more often, so we’ll plan to do so at least quarterly moving forward. We don’t claim to have a monopoly on market intelligence though. I’d love to hear what you’re seeing and what you think about the market in general, specific lenders, what you’d like us to do, or anything else you’re thinking about as you build and adjust your portfolio. Please click HERE to download a PDF of this January 2018 Quarterly Investor Letter. Please click HERE to download a PDF of this September 2016 Quarterly Investor Letter. 2016 has been a tumultuous year for investors. Between volatility in the stock market and a dearth of fixed income alternatives, many are questioning where to invest. We’re even seeing many of our customers pull their capital off of platforms like Lending Club. To fill that void, many investors have gotten creative – perhaps too creative – in looking for one-off opportunities to produce yield. In the meantime, it’s continued to be a strong time for AlphaFlow and our origination partners. However, general market conditions have led to an influx of new capital, which brings both challenges and opportunities for us as investors. Unfortunately, deciphering which is which isn’t always obvious, making discipline paramount. Below please find our thoughts on the real estate market and our industry. In a world of limited upside with debt investing (your return is generally capped by the interest rate), protecting your downside is critical. Prudent investing suggests a highly diversified portfolio is the most effective shield. In February 2016, we launched AlphaFlow Fund 1, the first of its kind in the real estate crowdfunding industry. The idea was simple: You make 1 investment, and we build you a diversified real estate portfolio. Since then, we’ve launched two more funds (Fund 3 is still open for investment until 9/24) and have invested in over 150 loans across over 20 states. Both Fund 1 and Fund 2 are on track to exceed their 9% target returns and are both substantially below the 75% target LTV ceiling we set. Within these two funds, we have one deal in default and with a 70% LTV on that specific property, we feel optimistic about making at least a full principal recovery ahead of the original maturity date. Investor re-investment has been high, as many of our clients have suggested they’ll continue to choose their own equity deals but we’ll now serve as the debt arm of their portfolio. With 75-100 properties per fund and a single K-1 at the end of the year, things are working well. I keep hearing real estate crowdfunding insiders speak loudly about consolidation coming to the space. We’ve been told only a few players would survive and that a 2-3 winners would emerge and ultimately absorb the loan volume currently originated by the long tail of smaller platforms. As we get ready to go into the 4th quarter, the world simply isn’t playing out that way. Instead, we’re seeing an increase in the number of platforms being launched by real estate veterans. Along with these new entrants, we’re hearing about a number of larger platforms significantly behind on their board-approved 2016 volume goals. That may mean a change in leadership at some platforms, but I also think it means a misunderstanding of how the real estate industry works. Our thesis continues to be that real estate is inherently fragmented because it is and should be a local business. Today, inputting a zip code into a database doesn’t tell the story of why a property on one street should be valued quite differently from a structurally similar building only two blocks away. The result is that the market defeats any winner-take-all scenario in loan originations, as the efficiencies of scale still lose to the superior underwriting that comes with local expertise. 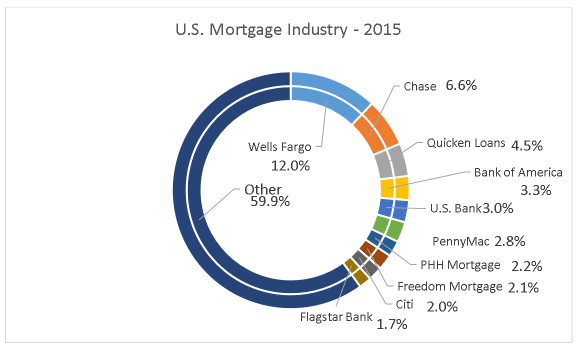 As an example, below please see an overview of the U.S. mortgage industry, in which the biggest player (Wells Fargo) owns about 12% of the market and the top 10 players combined represent about 40% of the market. Market-wide, we’ve seen interest rates decline as new players emerged and increased the competition for attractive borrowers. That does not seem to have decreased investor demand, as platforms like PeerStreet had to actually send out an email to users apologizing for how quickly they were filling deals. That’s a testament to PeerStreet’s work over the last year in establishing a platform with good tech, responsive customer service, and of course, strong underwriting. As mentioned in our previous quarterly letter, Patch of Land went through a small restructuring in the spring. Consequently, we did not heavily invest on their platform in Fund 1. 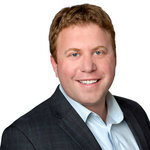 In April they brought on Paul Deitch as CEO to help scale the company. Since then, Paul has built a strong management team and impressed us in our in-person meetings. As a result, Fund 2 invested in a number of deals on the platform and we look forward to working more with the Patch team in the future. Housing is arguably the most important sector in the U.S. economy, accounting for 15-18% of GDP. Given its enormous position, it’s not surprising that growth in the housing market has often worked to pull the country out of recessions. However, when housing is the catalyst behind an economic near-collapse like we experienced in 2008, its potential role in any recovery is less clear. Internally, we caution against absolute acceptance of the term “the real estate market” when pundits and journalists attempt to speak about where we are in the cycle. Yes, home prices in Fort Myers, FL have some correlation to those in Portland, OR as both are affected by myriad factors including interest rates. Real estate is extremely local though, so being well below the peak nationally may not mean that parts of Santa Monica are not overheated. Similarly, feeling like we’re at the peak doesn’t mean there aren’t great opportunities in places like Austin, TX or Ashville, NC. Prudent investment means nuanced and local analysis. With that large caveat, below are some macro factors we’re paying attention to as we evaluate each and every deal on a local level. Yes, people are actually looking to buy and not just rent forever. A common topic today is how millennials aren’t buying homes and are instead choosing to be permanent renters. 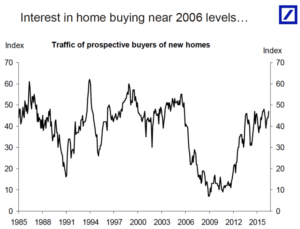 Whether it is that generation or others, buyer interest in purchasing homes has increased substantially in the last few years. One factor driving this: buying is now more affordable than renting in 58% of U.S. markets. Obtaining credit from banks is still difficult for many middle class borrowers though, leading to an increase in alternative lending opportunities. New home construction is certainly on an upswing, with a lack of workers actually serving as the bottleneck to even greater growth. 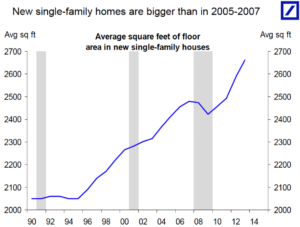 However, it’s incredible to see how much bigger new homes have gotten over time. There are a number of tailwinds supporting the rise in fix-and-flips. One is certainly illustrated in the graph below: buyers of average-sized homes have fewer opportunities to purchase new construction, spurring the rehabilitation of current housing stock. Conversely, we’ve been wary to participate in loans in homes above a particular valuation threshold (currently $800k for us), as the data around these properties is much less reliable above this hurdle. Given the additional market competition this type of property faces from new home construction, we subject these investment opportunities to greater scrutiny. There is a temptation by many investors to actually have a lower underwriting bar for these, as they may look prettier and be in neighborhoods where you’d want to live yourself, but that doesn’t necessarily make them great investment opportunities for us. As is often the case in real estate, the ugliest homes can lead to the most beautiful investments. Note: AlphaFlow is available today for all accredited investors. This AlphaFlow Quarterly Investor Letter is a summary highlighting key points regarding AlphaFlow Fund 1, LP (“Fund 1”) and AlphaFlow Diversification Fund 2, LP (“Fund 2”) to its investors. This document does not constitute an offer to sell or the solicitation of an offer to buy any security, product, service or fund. This document is for informational purposes only and is not intended to be, and must not be, taken as the basis for an investment decision. The information contained herein may not be used, reproduced or distributed to others, in whole or in part for any purpose without the prior written consent of AlphaFlow, Inc. (“AlphaFlow”). Neither AlphaFlow nor any of its affiliates is under any obligation to inform you if any of this information becomes inaccurate. No representations is made as to the accuracy and completeness of information obtained from third parties. This document is qualified in its entirety by the Offering Memorandum of AlphaFlow Diversification Fund 3, LP (“Fund 3”), which should be carefully read prior to any investment in Fund 3, a successor fund to Fund 1 and Fund 2. This document has been prepared for prospective investors who are legally eligible and are suitable to invest in the type of investment described herein. Generally, prospective investors would include investors who are “accredited investors” under the U.S. Securities Act of 1933, as amended (the “Securities Act”) and verified pursuant to rule 506(c) of Regulation D promulgated under the Securities Act. An investment in Fund 2 is suitable only for sophisticated investors and requires the financial ability and willingness to accept the high risks inherent in such an investment. It is the responsibility of any prospective investor to satisfy itself as to full compliance with applicable laws and regulations of any relevant jurisdiction. For a description of certain risk factors associated with an investment in Fund 3, please refer to the “Risk Factors and Conflicts of Interest” section of the Fund 2 Offering Memorandum. Interests in Fund 3 have not been and will not be registered under the securities laws of any U.S. State or Non-U.S. Jurisdiction, and have not been recommended or approved by any U.S. federal or state or any non-U.S. securities commission or regulatory authority. Furthermore, the foregoing authorities have not passed upon the accuracy or determined the adequacy of the information contained herein. Past performance is not indicative of future results. Any AlphaFlow Fund 1or Fund 2 investments listed herein are being provided for informational purposes only. Investments in real estate loans may result in the loss of principal. There can be no assurance that Fund 3 will be able to achieve the same portfolio composition and underlying loan terms as Fund 1 or Fund 2. These materials contain projections and other forward-looking statements. Any statements that are not historical facts are forward-looking statements that involve risks and are inherently uncertain. Sentences or phrases that use such words as “believe,” “anticipate,” “plan,” “may,” “hope,” “can,” “will,” “expect,” “should,” “goal,” “objective,” “projected” and similar expressions also identify forward-looking statements, but their absence does not mean that a statement is not forward-looking. Projections and other forward-looking statements, including statements regarding AlphaFlow’s assessment of the market, are by their nature uncertain insofar as actual realized returns or the projected results can change quickly based on, among other things, unexpected market movements, changes in interest rates, legislative or regulatory developments, errors in strategy execution, acts of God and other developments. There can be no assurance that projections and other forward-looking information will not change based on subsequent developments and without further notice, and no assurance can be given as to outcome. You should not place undue reliance on forward-looking statements, including forecasts and projections, and statements regarding the assessment of the market, which speak only as of the date referenced herein. These materials do not constitute legal, tax, financial or other advice. The legal, tax and other consequences of any proposed transaction may differ for each recipient as a result of, among other things, the particular financial situation of, and the laws and regulations applicable to, each recipient. You should consult your own legal counsel, accountants and other advisors regarding the information contained herein and the transactions described hereby.